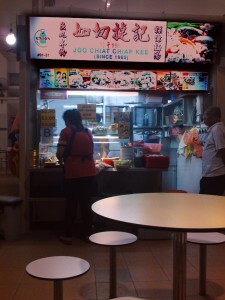 Home / Chinese Cuisine / Joo Chiat Chiap Kee – Still makes their own fishballs! What does it take for a bowl Mee Pok Tah to hit the mark for you? For me the requisite quality for a satisfying bowl of Mee Pok Tah aka Fish Ball Noodles is generous amount of Bak Chor aka minced pork and shiokadodo chili sauce(best if there are sambals in it). The rest of the ingredients are not really that important. Meat balls, fish balls, fishcakes are something that I can buy from the market easily and cheaply so who cares if we get to eat it or not outside right? Apparently when I eat out, it’s those things that I cannot easily produce at home that I will relish eating. For food like Hk style French Toast, it makes absolute sense to pay $3.50 for it when you would need a lot of oil for the whole toast to be fried at home and then you have to crack your brain thinking how not to waste the oil afterwards. 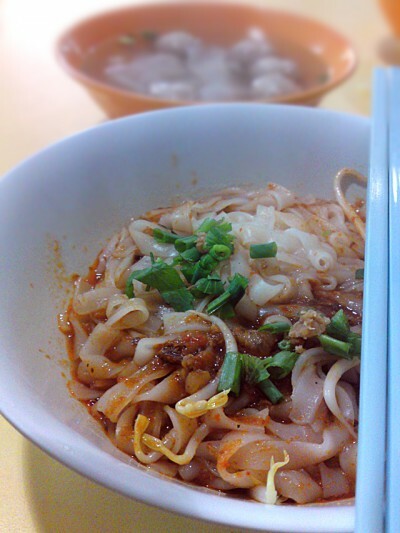 Joo Chiat Chiap Kee’s Mee Pok Tah has been around for a long time in Bedok Blk 216 market. It is one of those stalls in the market that has super long queues during meal times and of course, like all stalls having long queues, there is a good reason. Chiap Kee do not believe in outsourcing their fishballs and so makes their own. A family run business since 1965(according to the signboard), not only their fishballs are fantastic, their chili is seriously good too. There is a lot of sambal taste in it and it can create this super delicious ‘chopstick’ licking good effect when mixed with all other ingredients(pork lards, onions etc) in your bowl of Mee Pok Tah. Clearly this is one of those stalls that still prefers to stand out from the crowd by delivering authentic food. The fishballs here are small in size though big in flavour. It is full of that fresh fish taste and does not possess that ‘factory’ spongy texture. I am not a big fan of fishballs so I got them to change to meatballs and her giaos(fish dumpling) instead and it came in something like 5 meatballs and 5 her giao in the soup. I don’t know about you but for $2.50 I’ll grab that anytime! Conclusion: The special thing here is their non ‘factory’ made fishballs. Meat balls and Her Giaos to go too for $2.50 is an extremely good deal there. But the chili is power too so personally for me, it takes a lot to beat this stall interms of value. Go for pure meatballs or her giao version and I’m sure you’ll be left wondering why are they not charging you $4 for it! Likes: Fishball is good. Not stingy with ‘liao’(ingredients) and of course the power chili! Dislikes: Would be good if the soup can be that bit more ‘pang’. Maybe a bit of minced pork in it can do the trick! 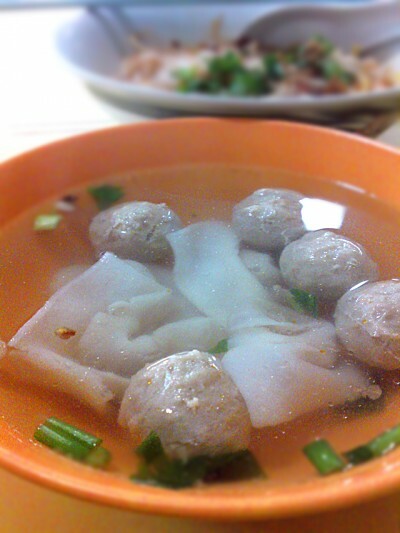 Looks nice… Fishball mee is one of my fav lunch choice! Their food is not bad. However, there are some cleanliness issues with it. I have personally seen cockroaches loitering in their stall. Even worse, I found one dead one submerged inside the bowl of noodles I ordered. I demanded the stall owner to explain it and he just waved me away, showing me his knuckles and asking me not to create trouble for him. Very very bad service.